At last nights Regatta Annual Public Meeting the committee announced a significant loss for last year of -£36,500. In addition the loss for 2016 has been adjusted after audit to -£20,000, a further -£8000 loss. Lesley Turner, the regatta honorary treasurer, announced that, as a result of these losses the regatta committee will need to make fundamental changes to the format of the regatta. Some of the causes of this loss include reduced turnover for the regatta of £177k, which is £14k down on last year. This comes from reduced income from collections (-40%), reduced income from car parking (2015 – £19k, 2016 – £10k, 2017 – £5.5K) and other reductions. Cost of sales were £95,300 up £5,500 on last year and Operational costs were £118,000. Overall the committee believes footfall for the regatta was down by 30%. Which reflects our own assessment of footfall trends in the town throughout the season. The details of the financial report will be published later when they become available to Dartmouth Business News. The Chairman, Ed Botteril, is away on duty but his Chairman’s message to the meeting was read out by Hilary Bastone. He stressed that times have changed and the costs of running the regatta have been escalating for some years now. He also stated that the current model is unsustainable and there will need to be significant changes to the format to save on costs. He thanked Devon County Council, South Hams District Council, Dartmouth Town Council, Dart Harbour Authority, the Royal navy and all of the volunteers who make the regatta possible. He also asked for more volunteers to come forward to give practical help to the regatta. 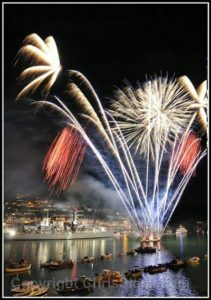 The 2018 Dartmouth Regatta will be held on 30th, 31st August and 1st September. The membership of the regatta committee were read out. Hopefully this will be published on the Regatta website? The Collector of the year was Ben Harper for the second year running. Under AOB there was then some debate over what needs to be done to ensure the regatta survives. This included the suggestion that, as well as reducing costs the committee must look at ways they can increase the footfall through better marketing and promotion of the event. It was suggested that Dartmouth Businesses should make a bigger investment in the regatta. While this is true it was suggested that the committee needs to look at ways of reducing the negative impact regatta has on some non riverside businesses in the town. Then there would probably be more financial support from Dartmouth businesses. How bizarre that it has required a substantial pair loss years to drive the message home that the Regatta requires a substantial streamlining, and re-alignment with the needs of the town, its people, and its businesses. I wonder if we can have the Raft Race back? Perhaps we can lose the multiple food outlets and the cheapjack stalls. I wonder if we might concentrate on fun, like the Tug of War (absent last year as far as I can determine) and ~ Golly Gosh ~ things afloat. Ok, when the fair arrives on the Mayors Avenue car park, where are those of us with no off road parking going to park? I am the Town Council’s representative on the Regatta Committee, but I am replying to Tim’s contribution and Paul’s report on my own behalf. The only points I would mention from Paul’s report are (a) Ben won collector of the year not on his own but jointly with two others. I emphasis this because all three of our top collectors live outside Dartmouth. (b) Paul omits his confrontation with the regatta president when he (Paul)raised the topic of footfall (yet) again. All I will say is that footfall is good but many people stick to the embankment and the parks and would not register on the footfall recorder. My view is known and I need not rehearse it, but money in the till is more important than footfall. Retailers do support regatta – the spot the oddity and the best-dressed windows are strongly supported. We need to build on that. Tim, the committee has wanted to have the raft race back for some time, but there are – wait for it – health and safety issues. Drowning participants is not encouraged. There are sufficient organisations on the river who can be asked to run safety boats for the raft race. Those that are charities will only wish for fuel costs to be contributed to. Personal buoyancy can be mandated. Rafts can be scrutineered. It works for The Dart Struggle on deeply difficult white water stretches of the Dart. The risk analysis is arduous, but is not dissimilar to the other risk analyses for water borne events. Perhaps the organisers of the Struggle would share theirs? The universal Health and Safety excuse does not wash.
How unwise of the Regatta Committee to have lost control of the fair. Perhaps our District Councillors might be prevailed upon to take up the challenge of making the Regatta good for local businesses. They do seem to end up on the Regatta Committee. Or is that a conflict of interest? David firstly I did not see my comments on footfall as confrontational. I see them as an important indicator of visitor numbers you and Hilary seem to want to discount them as unimportant. The -30% was not my footfall figure it came from Lesley so perhaps you should be challenging her. The fact people stick to the embankment and parks supports my view that town center businesses suffer during regatta and the committees long standing refusal to acknowledge this as a problem has lost them some support from businesses. I will keep raising it as an issue until those in control (like you) understand the importance of these drastic drops in visitor numbers. Hilary keeps responding that “everywhere is seeing drops in footfall”, this is a defeatist response and is not acceptable to me. In response to David Gent’s comments and to put the correct facts into the public domain, the Regatta Committee have sole responsibility for all the food outlets in the Royal Avenue Gardens, the Quay, Coronation Park and Mayor’s Avenue and is a good source of their income. The ‘cheapjacks’ area on the North Embankment Is let to a manager from which the Regatta Committee receive a percentage. The fairground have no outlets at all now outside the car park confines. Thank you for clarifying that element. It has long been misunderstood by everyone I know. There seems to be a huge disconnect between what is good for the Regatta Committee and what is good for the businesses of Dartmouth, certainly the food businesses. And not a lot is good for anyone located behind the soon to be vacant NatWest, food or ‘shopping’ as the footfall figures show. And yes I understand till contents. There is usually a correlation between footfall and the number of times the till rings. I presume no marquee means no food businesses on Coronation Park in 2018? The cheapjacks are… interesting. Is the percentage worth the effort? And why is yet more food allowed there? Wow a loss of about £10K a day ! And “Operational costs were £118,000” these are bonkers figures for an event run by qualified professionals ? Are the accounts available ? Yes they are david and I had a summary set at the meeting but someone picked them up before I left. Contact Lesley Turner for a copy. There were insufficient copies available at the meeting. I will publish it here when I can get hold of a copy. PS surprised the Chamber of Trade were not represented at the meeting? There was some criticism of Businesses for not supporting the regatta enough. I understand the criticism of Dartmouth businesses was not made by a member of the Regatta Committee. I would have thought the clearly processional committee would have worked with the Chamber of Trade from day one ? They invite the Town Council but not the Chamber, so what do they expect ? We are very approachable. I really would like to see the accounts, the list of committee members and a copy of the Chairman’s message/report. The word on the street is that the net assets of the Regatta are under £10K ? If so it would be reckless to stage another Regatta. Would Ed join in our debate here ? You say “The word on the street is that the net assets of the Regatta are under £10K ? If so it would be reckless to stage another Regatta” and, on the face of that statement it appears reasonable. It would be hard to disagree if the format of the regatta does not change substantially. If we postulate a substantially reduced ambition and hold a regatta that is for the benefit of the town, the businesses, the competitors and our tourists, and the coat is cut to suit the cloth, then I think that a regatta is supportable financially. I have met very few people who are in favour of the behemoth that the regatta has become, except the first time that they witness it. The behemoth is a spectacle, certainly, but it is ‘Not Dartmouth’, a beautiful town which is far greater than a once a year sporting event. I wont name the critic here as he was full of praise for my own businesses contribution to the oar funds, but he is a committee member as far as I know. I was on the committee as Chairman of the Business Forum so it is up to you to attend. I have to say the committee are not that interested in the effect of the regatta on Dartmouth businesses. several years ago I asked the philosophical question “who is the regatta for?” the answer from the then Chair was – I quote “the 60,000 people who come to the regatta”! Wrong answer in my view so you can see why we have a problem. It seems that the 60,000 is likely to shrink dramatically in 2018. If they do not start to make it for the people and businesses of Dartmouth and treat the visitors as a welcome bonus, then it will go bankrupt. Since bankruptcy concentrates the mind, and disqualifies some persons from holding certain future offices, and since they will go down in history as “The people whose ambition ruined Dartmouth Regatta for everyone” they will wish to avoid bankruptcy. Are they astute enough to understand that, do you think? AH! Of course. Light dawns. They will blame the new and sensible safety regulations for Air Shows. It will not be their fault at all. The three years when I was Regatta Chairman (having previously served 12 years as Hon Sec) I constantly reminded the committee that we were putting on a Regatta for the townspeople but worked to welcome visitors to come and enjoy it with us. I could probably find that quoted in the Press at that time. Sadly, the present Chairman has openly stated that he does not want the ‘old school’ back. Also, invites are not issued to public meetings, they are open to all and sundry. All committees need fresh eyes. All committee positions need to be created with finite length. But that does not prevent the current committee from needing to understand that they are almost bankrupt, and that this is the culmination of a bit of bad luck with a pilot at the Shoreham Air Show, and of a regatta which appears to alienate the town. So many people leave town for the regatta, avoiding the pervasive smell of burgers and onions, the pall of diesel exhaust for the fair, and the crowds on the embankment who bring very little to our businesses. I stay. My first regatta was a source of wonderment. That wonder turned to boredom. Then the 2016 Regatta ruined the surface of Coronation Park, and left it. That displaced Sunday pub cricket. Its hard to pay on a pitch with bunkers. A local man did something with a caterpillar tractor to try to rescue the surface, making it worse, and using inappropriate fill. We had ducks swimming in the puddles afterwards. No reinstatement by the Regatta Committee. Tractor man was, Think, his own initiative. They seemed not to care about the town, the one place that gave them the amenities to play with. The park surface is still wrecked. The current committee displays a disdain for the people who live here and work here and play here at other times of the year. Me? I stay. I work on the river in a role to help make our waterborne visitors welcome. There are fewer and fewer of those. The great rafts of Tupperware in the middle of the river have dwindled. Entries for the Sailing Week are low. Last year I counted only 116 entries. We had, I think, a lay day in the rowing races. With luck something good will come from the ashes. Dartmouth is a glorious town. Some were born here. I have chosen it as my forever home. I love it. But not during the mess that is the regatta, because it is not for the benefit of the town. Wendy It is refreshing to hear that because I think the regatta committee has lost sight of its objectives and become a behemoth that is self centered. I suspect its current problems may result in a change which makes it a better regatta for the townspeople although I am not holding my breath for that. 1. Back in tne dark days, when I was vice-chair of the Chamber of Trade, I was approached by the then Regatta chair (a friend of mine) who suggested I invite the Chamber to become involved with the Regatta committee. At the subsequent Chamber meeting, the only people who voted to do this were my wife and myself. Everyone else voted against. 2.Why was the current Chamber not invited to last week’s meeting? Why should they have needed an invitation? It is a public meeting. Town councillors are not specifically invited either, although the Mayor takes the chair by custom (probably dating back several decades). 3. How did the Regatta committee lose control of the car park? Greed – the fairground people offered a very large sum on money, far more than the regatta could afford. If you want someone to blame, try SHDC who own the carpark, or try the fair operators who offered an insane sum to price regatta out. Not a penny from the fairground goes to Regatta and most of it goes out of town. 4. Tim: it’s easy to mock health and safety regulations, but remember the opposite is unsafe and unhealthy. Would anyone really want that? Perhaps, though, you would be prepared to organise the raft race? I’ll put you in touch with the right people, if you contact me. 5. Paul: Your last post reads “This was pre bid”. Sorry? What are you talking about? Surely this meeting was post-bid? 6. I know, Paul, you will keep on about footfall, and I defend your right to do so. I will also keep reciting the mantra I learned at business school: Cash Flow is more important anything else in business: without it you are stuffed. And finally, it is worth knowing that already two major sponsors have signed up. Please do not trivialise things by mocking. Health and Safety is a subject I have some knowledge of. I approach it professionally in another role. I have a good understanding of safety matters afloat. A Raft Race requires a competent Risk Assessment. The Dart Struggle organisers may have one that the Regatta Committee can adapt. Health and Safety is not a universal screen one can hide behind and blame for not running things. If, as you say “Tim, the committee has wanted to have the raft race back for some time” then it is a matter of the committee putting its shoulder to the (paddle) wheel, performing the risk analysis, and opening the raft race for entries. Or are we looking at the definition of ‘want’? I want many things, some of which I could work towards, and choose to others of which I could work towards and choose not to. Still others I want in some ephemeral sense, a sense where I know the want is ludicrous, but might me fun if I ever achieved it, but are so far out of my real wishes that they are not worth it. No, thank you. I have no wish to run any part of the regatta. Your exhortation is like “If you want to change things, do it yourself!” No, David. I want you who have expressed the committee’s desire to have the raft race back to find a committee member who will enjoy doing the work. Paul, I understand your comments, but you have stated the wrong year. I was the Chairman in 2010 and we didn’t have the conversation. The 2009 Regatta made a loss, the third in a row. In 2010, we made a profit albeit only c£6k. But that turn around should have continued. There are a lot of very willing and very hard working members of the committee who care deeply about Regatta and what it means to the town. But there are people who think they can organise certain aspects and volunteer to do so. However, I’ve seen a number come and go who frankly didn’t have a clue and they cost Regatta serious money. There is also a few who believe they are entitled to “perks” for being a member of the committee or simply helping for a few hours. Whilst I was Chairman, I hosted the Chairman’s table at the Regatta Ball. I almost argued with the treasurer at the time, when I insisted on paying the bill for “my” table. I was then told I was the first Chairman in history to pay the Chairman’s table bill, which was c£3,400! I viewed being Chairman of Regatta as an honour and one of which I was very proud. There should be no “perks” and the differing aspects of Regatta that generate the income, should be scrutinised every year at the planning stage and post Regatta and if they don’t work, change them. Don’t hide behind “that’s tradition”. If Regatta can’t afford it, change it or stop it. David Gent is right in his view of SHDC in the demise of Regatta. The car park changes were beyond belief and then the decision to take the New Ground away from Regatta really does need a stewards inquiry. Those two elements probably cost Regatta c£25k per year. A successful Regatta rarely gets into double figures, so it’s no wonder they’re struggling. This year will be my 35th Regatta. I have always described it as a magical event that really is for the whole family, where you can join with the locals and celebrate everything that is Regatta. That seems to have been overtaken by the need to take money without focussing on the end product. The Red Arrows is a massive loss and to this day, I don’t understand the decision. An amateur pilot crashed an aircraft well away from the show he was performing at. As a result restrictions have been placed on not only professional pilots, but probably the best pilots flying. Could you imagine an amateur pilot landing at Denham, crashing on the M25. Would the CAA stop professional pilots from doing it as well, leading to the closure of Heathrow? The decision to restrict the airshows at Dartmouth by the very best professional pilots because of what happened at Shoreham is ridiculous and should be challenged. It’s easy fixing Regatta from afar and without responsibility. But any action that costs regatta, be it by Central or local government, should be challenged as robustly as possible. Of course these volunteers have no other life other than to help run Regatta and get criticised for doing it. They need the support of everyone in Dartmouth and with a bit of planning and a little luck, I’m sure they will turn things around. I’ll be there this year supporting what I can and I’ll make sure I put some money in the bucket! Well done and good luck to the Regatta Committee. Sorry Jim as I said I was guessing the year and it certainly wasn’t you I spoke to. Time flies a bit too fast at our age! I agree the volunteers who make the regatta happen are brilliant dedicated people who are doing a great job for Dartmouth. You know I will always look at the regatta from a Dartmouth business point of view because of my involvement with the Chamber of Trade. So my criticisms are always meant to be constructive but also always in support of local businesses who don’t all benefit from regatta. I am anti air show because whenever I challenged the presence of the ‘cheap jack’s’ along the embankment the argument was always “we need them to pay for the air displays”! Trouble is they take a lot of trade and income away from local businesses who battle through the off season and try and survive on what they can make in the high season, i.e. regatta time. I hope the regatta can continue, if it means we have to strip out some of the events and lose some footfall but we increase trade for local businesses then that’s great. If we can focus more on the water based events, which after all is where regatta started all those years ago, then that is also better. I think the town would be better served by a smaller event aimed at locals and visiting competitors, but with visitors more than welcome then we may find the best compromise. But that is just my opinion. I have asked the town council to urge the regatta committee to discuss these issues more openly and in consultation with both the residents and business owners in town. I hope they follow up on that. Peter Avis Paul, am I right in my understanding that South Hams DC sells the use of the Mayors Avenue Car Park during Regatta to the fair ground, and also charge the Regatta to extend the Park and Ride? Isn’t that having your cake and eating it? What is their involvement in the cheap eateries that get set up over Regatta – nobody else seems to want them! Paul William Reach Peter Avis if you look at some of the comments on the website you will see that SHDC put mayors ave out to tender. The regatta put in a bid but the DeVeys who own the Fair outbid them. So you are right it is SHDC who remove the lower town parking and SHDC who charge us for extending the park and ride. Strange when you consider that our SHDC councillors are also regatta committee members and often Chairmen!!!! Seems the regatta is filling the financial cutbacks suffered by SHDC from central government. Ironic they will kill the regatta if this continues. Paul William Reach The cheapjacks are apparently run by a management company who pay a percentage to the regatta committee. Again we are selling out our own economic health to fund the regatta. Many businesses see a downturn during regatta. I cant estimate the net effect of this on our economy but it doesn’t need to happen. Where is this on Facebook ?? On my own page Paul Reach. Still can’t find it, do you think you could give us a direct link please ? This is getting silly Paul, that link does not work ! perhaps you are not friended or my security settings are blocking. cant think of any thing else i can try. Ed was handed a poisoned chalice. The committee never accepted change so this was inevitable. Surely a seasoned professional such as Ed Botteril, would not have taken a poisoned chalice ??? He will now be known as the man that killed Dartmouth Regatta and also as you can see above, he rejected a lot of talented local people leaving bad feeling and resentment ? Have you seen the accounts ? Appealingly bad management………………..
Gotta love your Freudian typo, there, with ‘appealing’. Not fair I think, to land this all on one person. They all made this mess, and several committee iterations before them. They sowed the wind. He reaps the whirlwind. The Regatta needs to be first and foremost a celebration for the TOWN. That means getting back to the original basics, and recognising that all the fluff and flummery of air shows and such like is banal ordure. We, Dartmouth, need to own it, enjoy it, compete in it, be pleased with it. And we can enjoy sharing it with a wonderful influx of tourists, too, to boost our Dartmouth businesses, not those of some management company who give a percentage to an organisation that can lose £10,000 per day and alienate the townsfolk. I had a copy of the summary accounts at the meeting but they were taken by someone else. Ed would not have anticipated the 30% drop in footfall and that is down to the history of the regatta. He does not bear all of the responsibility for this. The 30% drop was in fact easily anticipated due to the lack of the Red Arrows, they must have thought of that ?? Dave, Paul is right in as much as this is not Ed’s Regatta. I had constant fights over what I considered to be basic and obvious business sense, with members who clearly didn’t understand the business case having their say and if there were enough of them, they won! Crazy!? When there were conversations about the boats, I listened because that was not my expertise. When it came to costs, I piped up and tried to make whatever was decided happen. I still don’t see Regatta vanishing. I’m sure the water borne elements will continue and maybe the opportunity to re-evaluate the whole event will turn out to be a positive thing. As for the “cheap jacks”, that element has been slowly going down hill since around 2005. When the Regatta decided to cancel contracts with Anderton and Rowland, the cheap jacks was one of the prime reasons. So this has been evaporating long before Ed took the reigns. But the current incarnation does nothing for the event or the image and therefore should go. Maybe an alternative would be to offer the space to local traders, who in turn may wish to sponsor something, or donate to Regatta. Whilst Ed is planning out this year’s event, he will identify the events/activities that make money and he will be reliant on the people running those aspects to deliver. He also needs to think carefully how he reverses the current downward trend. Less footfall, less competitors/traders come. Less traders come, less footfall. As a business, you can keep cutting costs and make the event smaller and smaller, effectively following the downward spiral. Or, you sit down and think about how you stop the spiral. How do you raise the profile of the event. How about some clever marketing. Talk the event up, not down. First priority is to generate the footfall again, then sell that to the competitors/traders and when I say traders, I don’t mean via the cheap jacks. But the bottom line is it needs to be a team effort and the members need to be able to deliver. Another aspect of Regatta that is down is the revenue from buckets. Anyone in Dartmouth could do an invaluable job and have a lot of fun by simply rattling a bucket for a few hours. All it costs is a phone call and a few hours of their time. Ed and his committee now have a difficult job turning the spiral around. But be under no illusions, the largest portion of blame doesn’t sit with the committee, but with SHDC, who are too ignorant to understand what they have done, or are too greedy to care. It’s a good job the people of Dartmouth aren’t paying their wages!?! Ed alienated the old school, see above where a Honorary Steward of Dartmouth Regatta says “Sadly, the present Chairman has openly stated that he does not want the ‘old school’ back.” People were asked for their CV and to re-apply for their committee role. There was no viable business plan, the buck stops with Ed I’m afraid. I hope Regatta is recovered and morphs into something smaller and more for locals, the tourists might even enjoy it more too ?